The Index opened positive above 8400 and stayed positive throughout the entire session of trade making a high of 8458.90 but closed lower at 8421.80, gain of 46.75 points. The broader market was positive, with 970 advances to 533 declines. The range at the start of series comes to 8200-8800. Call option 8000-9100 added huge 37.14 lacs OI. Put option 9000-7900 added huge 32.79 lacs OI. 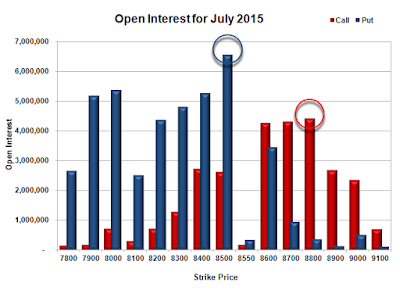 Nifty Open Interest is at 1,66,04,575 up by 39,87,025, with increase in price, 100% roll-over with huge long build-up. Bank Nifty Open Interest is at 19,23,975 up by 7,01,000, with increase in price, 100% rollover with long build-up. FII’s sold 2.16 lacs Futures, which includes 195958 contracts long liquidation and 211268 contracts short covering, with decrease in net OI by 407226 contracts (includes 163642 longs to 172297 shorts for the day) and the Average Price comes to 8817.48. FII’s Index future open contract as on date is 463279 Longs to 126029 Shorts, Net Long 337250 contracts. Initial support at 8400, with OI of 21.58 lacs and below that at 8200 with OI of 36.48 lacs. Initial resistance at 8500, with OI of 23.02 lacs and above that at 8800 with OI of 28.19 lacs. Day Range as per Option Table is 8362 - 8494 and as per VIX is 8354 - 8489 with 8430 as the Pivot. The Index opened positive and stayed positive albeit in a narrow range for entire session of trade and closed near the top at 8375.05, gain of 38.05 points. The broader market was positive, with 910 advances to 597 declines. The range for expiry as per OI table comes to 8300-8500. 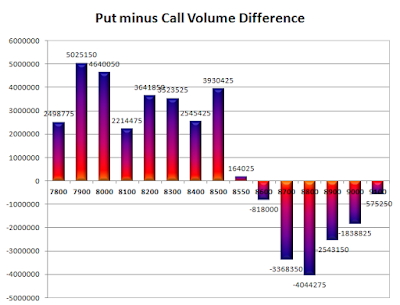 No Call option added any OI whereas short covering was seen at 8400 and below strike prices. Put option 8350-8100 added huge 15.85 lacs OI with huge short covering seen at 8400 and above strike prices. Nifty Open Interest is at 1,14,88,875 down by 33,77,125, whereas August series added 29.89 lacs with increase in price, mostly rollover with small short covering. Bank Nifty Open Interest is at 11,54,975 down by 3,33,500, whereas August series added 3.78 lacs with increase in price, most probably 100% rollover with small long build-up. FII’s sold 15.83 lacs Futures, which includes 39643 contracts long liquidation and 23662 contracts short build-up, with decrease in net OI by 15981 contracts (includes 222437 longs to 285742 shorts for the day) and the Average Price comes to 8568.32. FII’s Index future open contract as on date is 659237 Longs to 337297 Shorts, Net Long 321940 contracts. 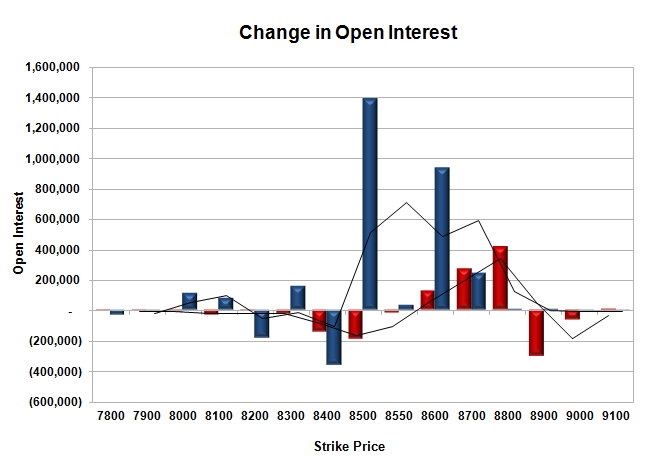 Initial and best support stays at 8300, with OI of 52.27 lacs and below that at 8200 with OI of 45.78 lacs. Initial resistance at 8400, with OI of 46.84 lacs and above that at 8500 with highest OI of 57.31 lacs. Day Range as per Option Table is 8302 - 8435 and as per VIX is 8305 - 8445 with 8365 as the Pivot. The Index opened flat to positive and stayed in a narrow range for the better part of the day only to see sell-off to the lows of the day at 8321 only to close a bit higher at 8337.00, loss of 24.00 points. The broader market was weak, with 685 advances to 795 declines. 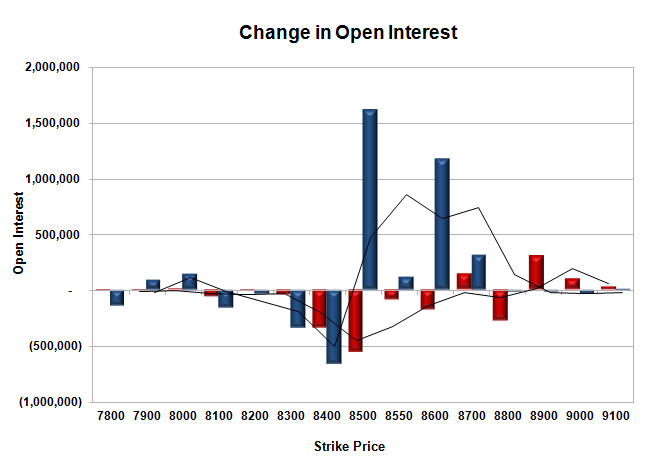 The range as per OI table comes to 8200-8500. 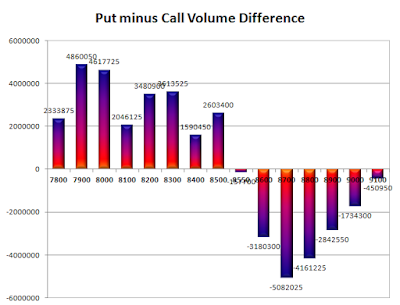 Call option 8300-8500 added huge 31.63 lacs OI with profit booking seen at 8600 and above strike prices. Put option 8400-8350, 8200-8100 added huge 11.70 lacs OI with huge short covering seen at 8500 and above strike prices. Nifty Open Interest is at 1,48,66,000 down by 30,93,950, whereas August series added 4.49 lacs with decrease in price, most probably 100% rollover with short build-up. Bank Nifty Open Interest is at 14,88,475 down by 1,80,650, whereas August series added 3.30 lacs with increase in price, most probably 100% rollover with long build-up. FII’s sold 2.30 lacs Futures, which includes 43477 contracts long build-up and 52665 contracts short build-up, with increase in net OI by 96142 contracts (includes 302147 longs to 311335 shorts for the day) and the Average Price comes to 8518.27. FII’s Index future open contract as on date is 698880 Longs to 313635 Shorts, Net Long 385245 contracts. Initial and best support still at 8300, with OI of 46.47 lacs and below that at 8200 with OI of 43.42 lacs. 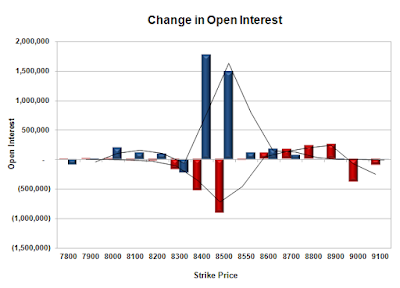 Initial and best resistance at 8400, with highest OI of 61.08 lacs and above that at 8500 with OI of 59.36 lacs. 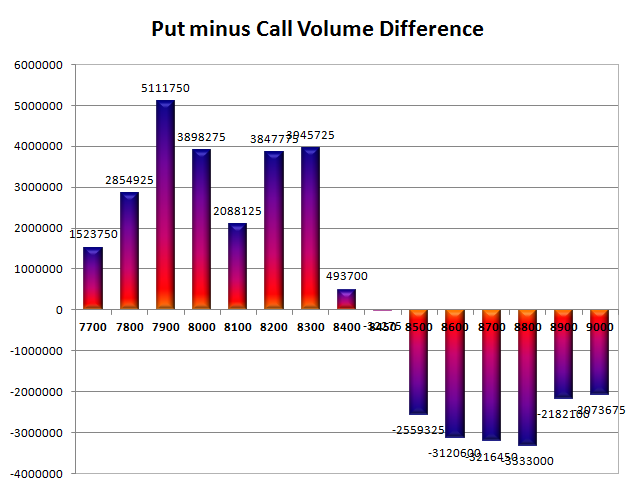 Day Range as per Option Table is 8276 - 8421 and as per VIX is 8268 - 8406 with 8352 as the Pivot. The Index opened weak and saw huge selling pressure throughout the entire session of trade to close near the lows 8361.00, huge loss of 160.55 points. The broader market was weak, with 441 advances to 1085 declines. 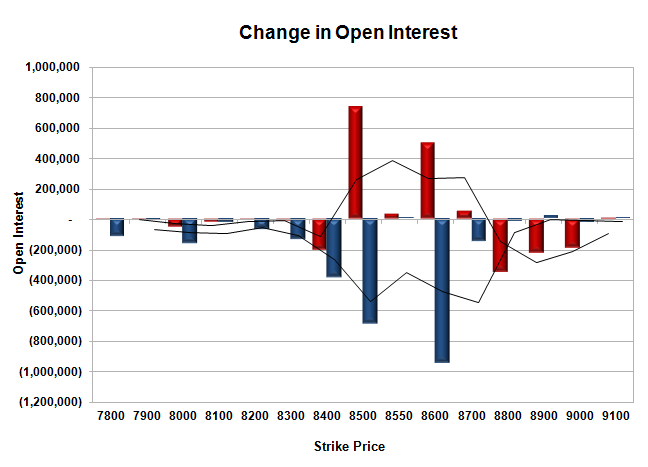 The range as per OI table comes to 8200-8600. 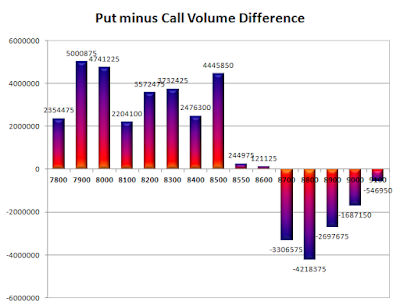 Call option 8300-8600 added huge 63.04 lacs OI with profit booking seen at 8700 and above strike prices. Put option 8350-8100 added huge 11.41 lacs OI with huge short covering seen at 8400 and above strike prices. Nifty Open Interest is at 1,79,59,950 down by 20,06,250, whereas August series added 2.11 lacs with huge decrease in price, most probably 100% rollover with small short build-up. Bank Nifty Open Interest is at 16,69,125 down by 1,68,275, whereas August series added 1.83 lacs with decrease in price, most probably 100% rollover with short build-up. FII’s sold huge 16.27 lacs Futures, which includes 31991 contracts long liquidation and 33079 contracts short build-up, with increase in net OI by 1088 contracts (includes 152064 longs to 217134 shorts for the day) and the Average Price comes to 8492.06. 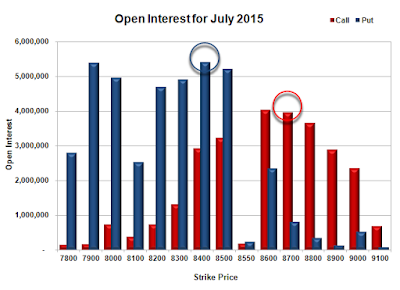 FII’s Index future open contract as on date is 655403 Longs to 260970 Shorts, Net Long 394433 contracts. 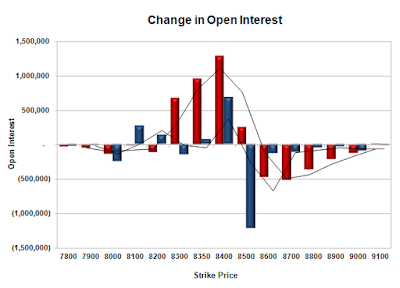 Initial and best support has moved down to 8300, with OI of 48.00 lacs and below that at 8200 with OI of 42.09 lacs. Initial strong resistance at 8400, with OI of 48.22 lacs and above that at 8500 with OI of 56.85 lacs. 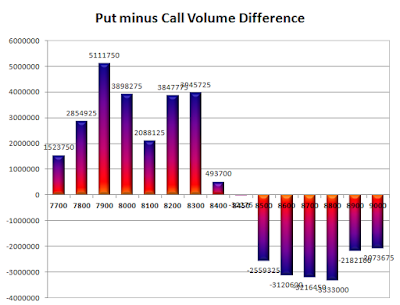 Day Range as per Option Table is 8314 - 8467 and as per VIX is 8289 - 8433 with 8402 as the Pivot. The Index opened flat to negative and stayed negative for the entire session of trade with huge sell-off seen in the last hour of trade to close near the lows 8521.55, loss of 68.25 points. The broader market was weak, with 573 advances to 947 declines. The range as per OI table is 8300-8700. Call option 8500-8700 added huge 30.31 lacs OI with profit booking seen at 8900 and above strike prices. No Put option added any OI whereas huge short covering seen at 8500 and above strike prices. Nifty Open Interest is at 1,99,66,200 down by 7,11,250, whereas August series added 4.77 lacs with decrease in price, most probably rollover with huge long liquidation. Bank Nifty Open Interest is at 18,37,400 up by 19,400, whereas August series added 0.59 lacs with decrease in price, most probably short build-up. FII’s sold 1.93 lacs Futures, which includes 12465 contracts long liquidation and 4738 contracts short covering, with decrease in net OI by 17203 contracts (includes 65903 longs to 73630 shorts for the day) and the Average Price comes to 8674.77. 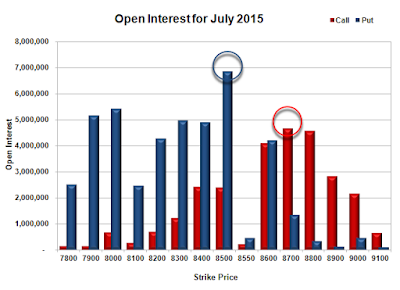 FII’s Index future open contract as on date is 687394 Longs to 227891 Shorts, Net Long 459503 contracts. Initial and best support stays at 8500, with OI of 55.96 lacs and below that at 8400 with OI of 40.12 lacs. 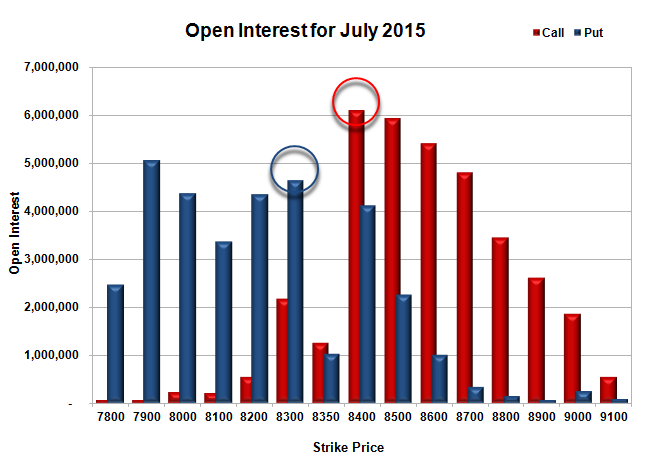 Initial strong resistance at 8600, with OI of 53.19 lacs and above that at 8700 with highest OI of 58.11 lacs. 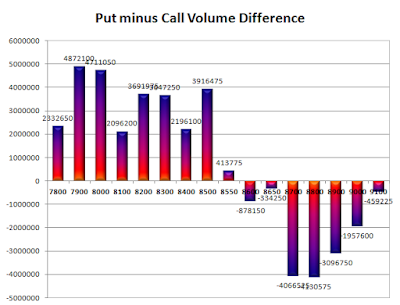 Day Range as per Option Table is 8469 - 8603 and as per VIX is 8453 - 8591 with 8541 as the Pivot. The Index opened flat to positive and went on to touch the high of the day at 8655. Huge unwinding from the highs saw the index dip below the psychological level of 8600 and closed near the lows at 8589.80, loss of 43.70 points. The broader market was flat, with 768 advances to 736 declines. 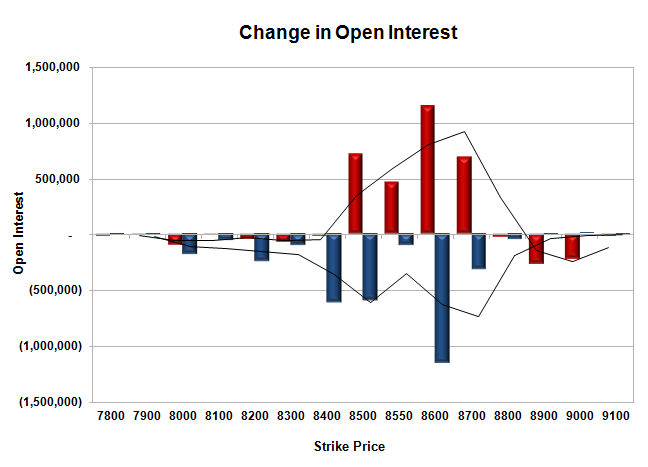 The range as per OI table has boiled down to 8500-8700. Call option 8600-8700, 8900-9000 added huge 12.95 lacs OI with profit booking seen at 9100 and above strike prices. 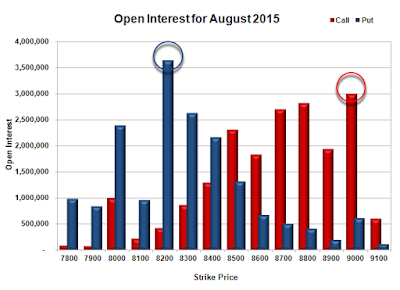 Put option 8550, 8200 added 2.67 lacs OI with huge short covering seen at 8600 and above strike prices. Nifty Open Interest is at 2,06,77,450 down by 7,52,375, whereas August series added 2.63 lacs with decrease in price, most probably small rollover with huge long liquidation. Bank Nifty Open Interest is at 18,18,000 up by 1,500, whereas August series added 0.65 lacs with decrease in price, most probably short build-up. FII’s sold huge 5.60 lacs Futures, which includes 2847 contracts long liquidation and 19550 contracts short build-up, with increase in net OI by 16703 contracts (includes 61174 longs to 83571 shorts for the day) and the Average Price comes to 8742.97. 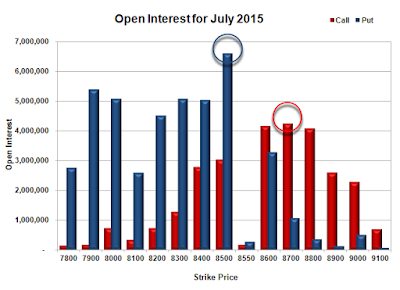 FII’s Index future open contract as on date is 699859 Longs to 232629 Shorts, Net Long 467230 contracts. 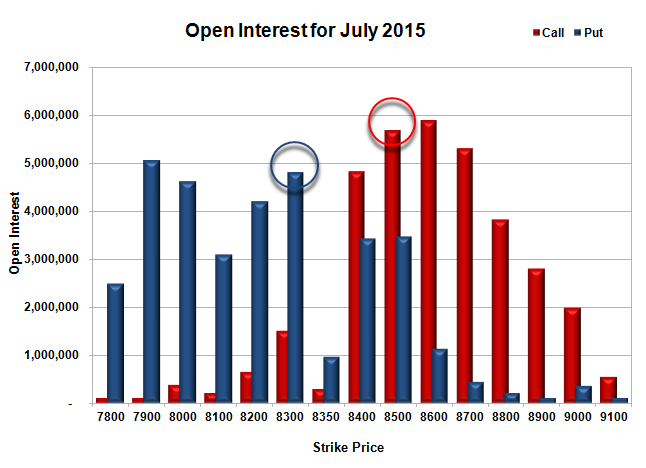 Initial and best support at 8500, with highest OI of 61.93 lacs and below that at 8400 with OI of 46.30 lacs. 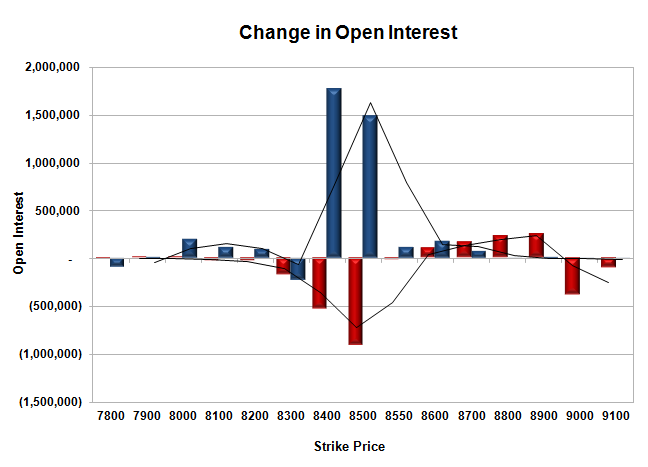 Initial and best resistance at 8700, with OI of 51.14 lacs and above that at 8800 with OI of 44.46 lacs. 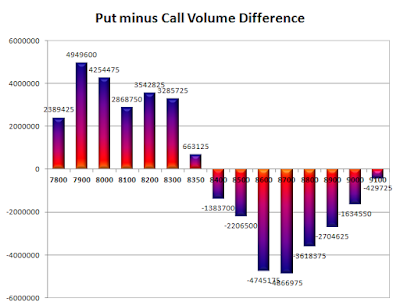 Day Range as per Option Table is 8531 - 8672 and as per VIX is 8520 - 8660 with 8606 as the Pivot. The Index opened flat to negative and went on to touch the lows of the day around 8499, where from the responsive buyers took control and moved the index back in green and above 8600 with ease to close near the top at 8633.50, huge gain of 104.05 points. The broader market was strong, with 1027 advances to 485 declines. 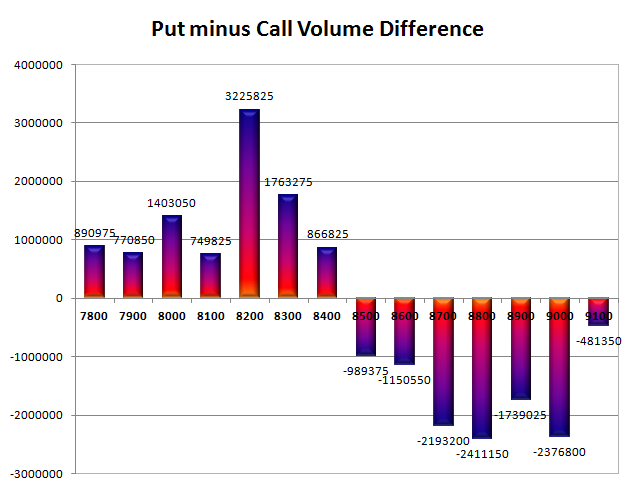 The range as per OI table is now at 8500-8800. Call option 8700-8900 added huge 11.73 lacs OI with huge short covering seen at 8600 and below strike prices. Put option 8700-8300 added huge 37.01 lacs OI with profit booking seen at 8200 and below strike prices. 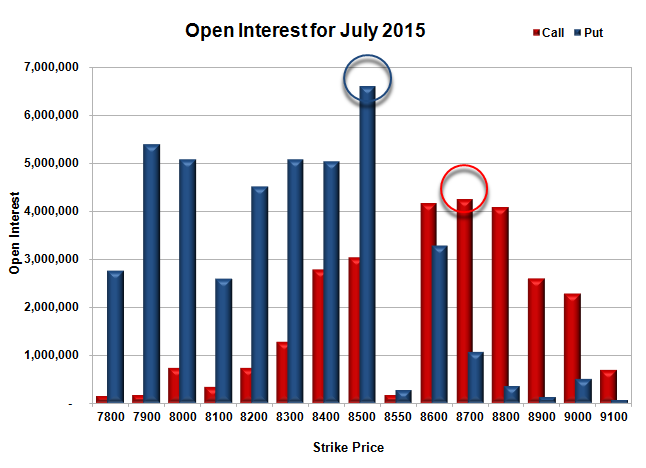 Nifty Open Interest is at 2,14,29,825 up by 7,24,150, with increase in price, most probably huge long build-up. Bank Nifty Open Interest is at 18,16,500 up by 53,325, with increase in price, most probably long build-up. FII’s sold 3.72 lacs Futures, which includes 3630 contracts long build-up and 18511 contracts short build-up, with increase in net OI by 22141 contracts (includes 72047 longs to 86928 shorts for the day) and the Average Price comes to 8789.56. 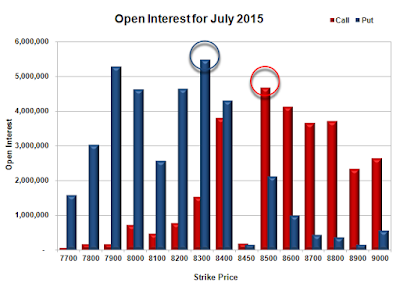 FII’s Index future open contract as on date is 702706 Longs to 213079 Shorts, Net Long 489627 contracts. 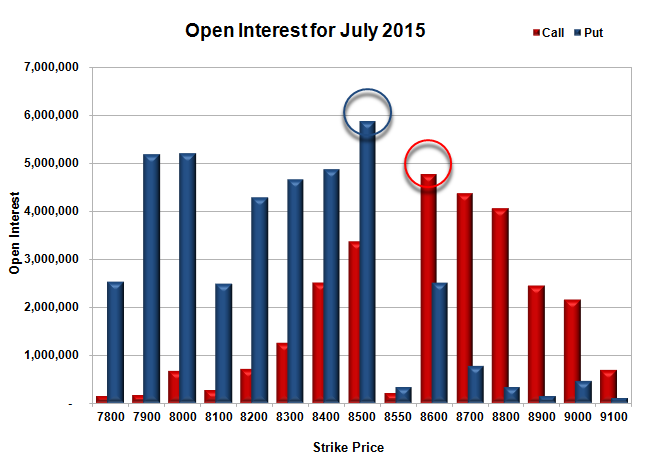 Initial support at 8600, with huge OI addition of 17.04 lacs and below that at 8500 with highest OI of 68.48 lacs. Initial and best resistance at 8700, with OI of 46.64 lacs and above that at 8800 with OI of 45.67 lacs. 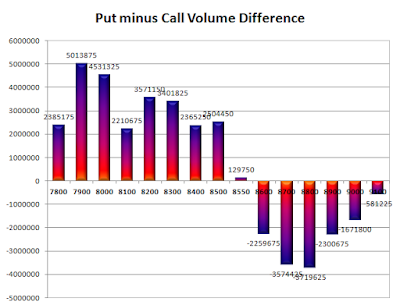 Day Range as per Option Table is 8532 - 8675 and as per VIX is 8565 - 8702 with 8592 as the Pivot. The Index opened flat and stayed in a narrow range for the better part of the day but saw huge un-winding in the last one hour of trade to close near the lows at 8529.45, huge loss of 74.00 points. The broader market was weak, with 356 advances to 1172 declines. The range as per OI table is now at 8200-8800. Call option 8500-8700 added huge 13.23 lacs OI with profit booking seen at 8800 and above strike prices. 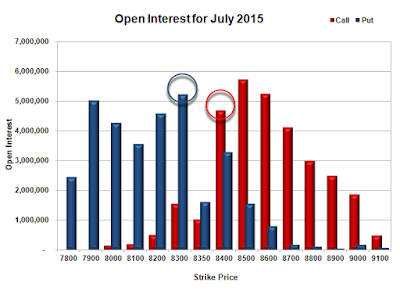 No Put option added any OI whereas huge short covering was seen at 8600 and above strike prices. 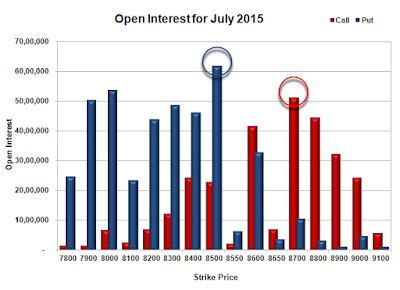 Nifty Open Interest is at 2,07,05,675 down by 7,07,250, with decrease in price, most probably huge long liquidation. 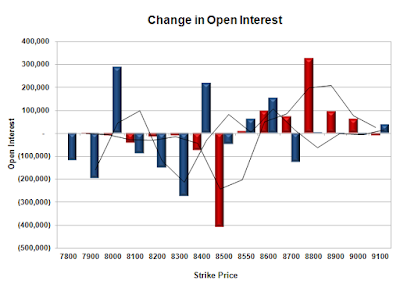 Bank Nifty Open Interest is at 17,63,175 up by 15,675, with decrease in price, most probably short build-up. FII’s bought huge 12.25 lacs Futures, which includes 19457 contracts long build-up and 29545 contracts short covering, with decrease in net OI by 10088 contracts (includes 80969 longs to 31967 shorts for the day) and the Average Price comes to 8622.96. 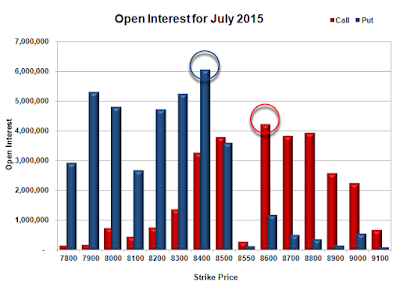 FII’s Index future open contract as on date is 699076 Longs to 194568 Shorts, Net Long 504508 contracts. Initial and best support at 8500, with highest OI of 58.68 lacs and below that at 8400 with OI of 48.75 lacs. 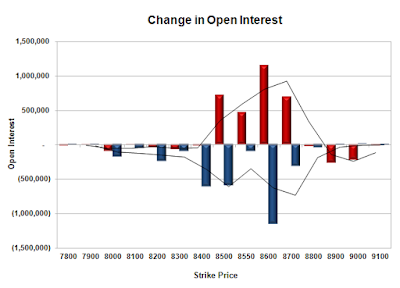 Initial resistance at 8600, with OI of 47.64 lacs and above that at 8700 with OI of 43.65 lacs. 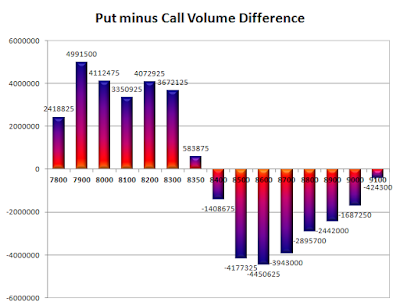 Day Range as per Option Table is 8491 - 8621 and as per VIX is 8462 - 8597 with 8565 as the Pivot. The Index opened positive but saw profit booking from the start to the lows of the day at 8559 where the responsive buyers took control to move the index back in green but closed just lower at 8603.25, small loss of 6.40 points. The broader market though was positive, with 797 advances to 718 declines. 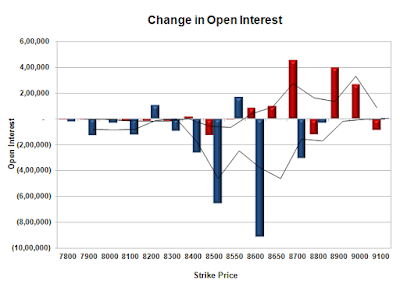 The range as per OI table is now at 8500-8800. Call option 8600-9000 added 6.47 lacs OI with short covering seen at 8500 and below strike prices. Put option 8600-8400, 8000 added huge 6.67 lacs OI with profit booking seen at 8300 and below strike prices. 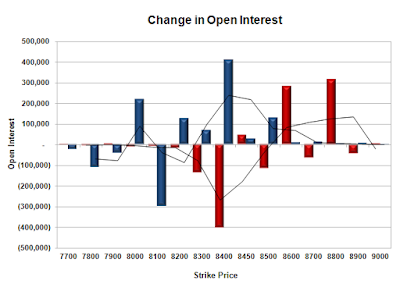 Nifty Open Interest is at 2,14,12,925 up by 2,23,250, with not much change in price, most probably long/short build-up. Bank Nifty Open Interest is at 17,47,500 down by 1,27,100, with decrease in price, most probably huge long liquidation. 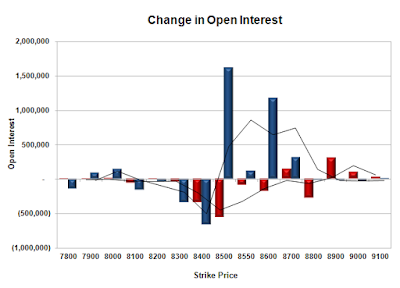 FII’s sold 0.53 lacs Futures, which includes 2606 contracts long build-up and 4737 contracts short build-up, with increase in net OI by 7343 contracts (includes 43469 longs to 45600 shorts for the day) and the Average Price comes to 8736.02. FII’s Index future open contract as on date is 679619 Longs to 224113 Shorts, Net Long 455506 contracts. 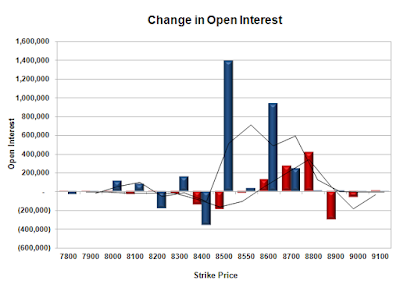 Initial support stays at 8600, with OI of 34.47 lacs and below that at 8500 with highest OI of 65.59 lacs. 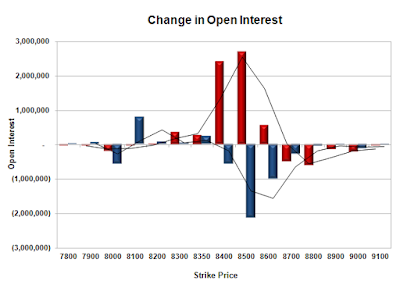 Initial resistance at 8700, with OI of 43.12 lacs and above that at 8800 with OI of 44.02 lacs. Day Range as per Option Table is 8535 - 8659 and as per VIX is 8536 - 8671 with 8596 as the Pivot. The Index opened positive and went on to make the highs of the day at 8643 within the first few minutes of trade, but profit booking at higher level saw the index close flat at 8609.85, small gain of 1.80 points. The broader market was just negative, with 749 advances to 764 declines. 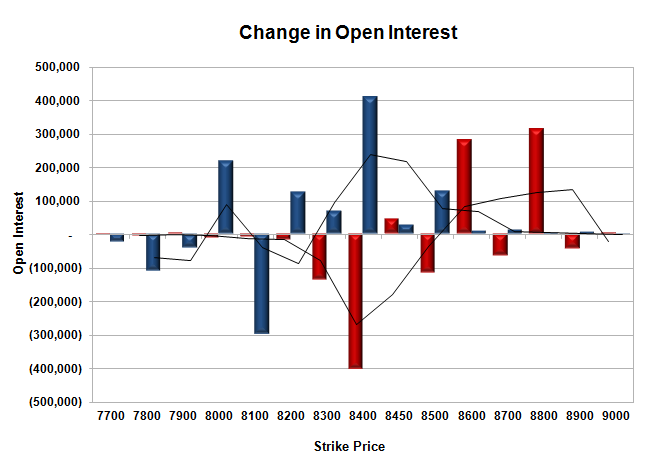 The range as per OI table stays at 8300-8800. Call option 8600-8800 added 8.16 lacs OI with short covering seen at 8500 and below strike prices. Put option 8700-8500 added huge 26.17 lacs OI with profit booking seen at 8400 and below strike prices. Nifty Open Interest is at 2,11,89,675 down by 92,350, with no change in price, most probably long liquidation/short covering. 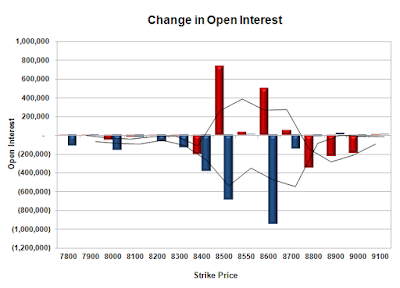 Bank Nifty Open Interest is at 18,74,600 down by 1,550, with decrease in price, most probably small long liquidation. FII’s bought 2.64 lacs Futures, which includes 3017 contracts long build-up and 7524 contracts short covering, with decrease in net OI by 4507 contracts (includes 50273 longs to 39732 shorts for the day) and the Average Price comes to 8765.93. FII’s Index future open contract as on date is 677013 Longs to 219376 Shorts, Net Long 457637 contracts. Initial support at 8600, with OI of 32.94 lacs and below that at 8500 with highest OI of 66.08 lacs. Initial and best resistance at 8700, with OI of 42.40 lacs and above that at 8800 with OI of 40.79 lacs. Day Range as per Option Table is 8549 - 8677 and as per VIX is 8543 - 8677 with 8615 as the Pivot. The Index opened positive and stayed strong for the entire session of trade making new highs with each passing hour to close near the top at 8608.05, gain of 84.25 points. The broader market was positive, with 851 advances to 652 declines. The range as per OI table has moved up to 8300-8800. Call option 8700, 8900-9000 added 5.43 lacs OI with short covering seen at 8500 and below strike prices. Put option 8700-8500 added huge 32.17 lacs OI with profit booking seen at 8400 and below strike prices. Nifty Open Interest is at 2,12,82,025 up by 7,95,250, with increase in price, most probably huge long build-up. 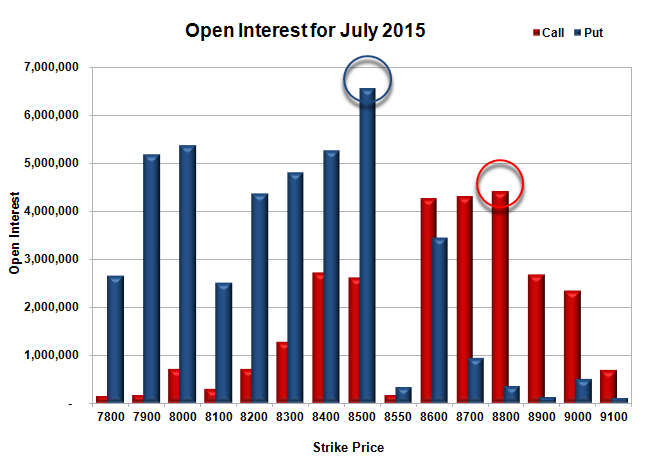 Bank Nifty Open Interest is at 18,76,150 up by 1,55,075, with increase in price, most probably huge long build-up. FII’s bought huge 15.96 lacs Futures, which includes 55250 contracts long build-up and 8582 contracts short covering, with increase in net OI by 46668 contracts (includes 127619 longs to 63787 shorts for the day) and the Average Price comes to 8725.65. 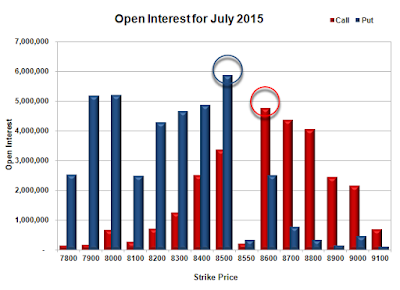 FII’s Index future open contract as on date is 673996 Longs to 226900 Shorts, Net Long 447096 contracts. Initial support up at 8600, with huge OI addition of 11.77 lacs and below that at 8500 with OI of 52.17 lacs. Initial resistance at 8700, with OI of 39.69 lacs and above that at 8800 with OI of 36.63 lacs. Day Range as per Option Table is 8527 - 8660 and as per VIX is 8541 - 8675 with 8589 as the Pivot. The Index opened flat to positive but saw huge buying interest within the first few minutes of trade to scale 8500 and stayed above it for the rest of the day to close near the top at 8523.80, gain of 69.70 points. The broader market though was positive, with 845 advances to 654 declines. 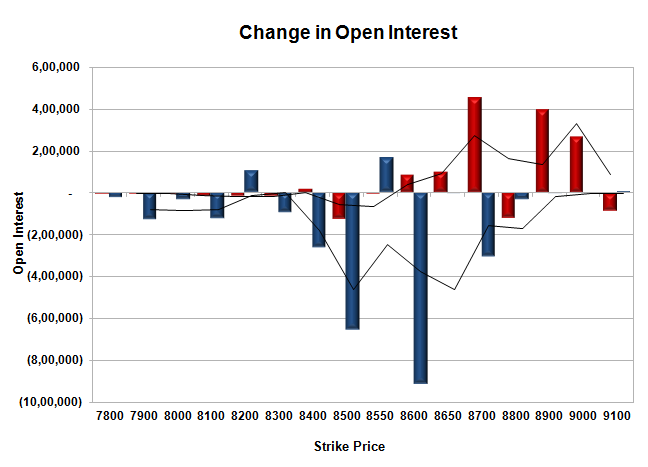 The range as per OI table has moved up to 8200-8800. 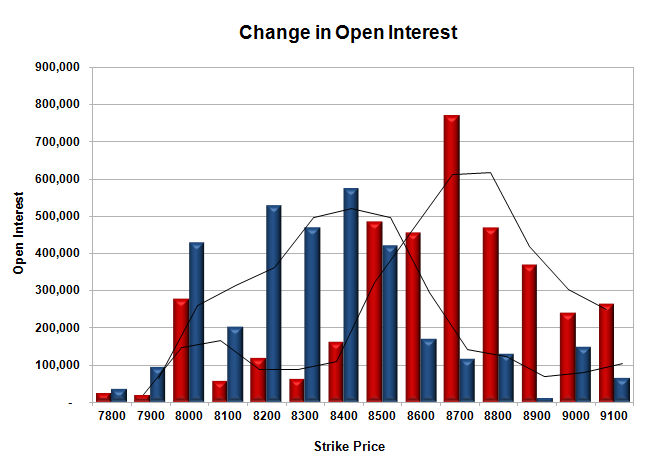 Call option 8600-8900 added 7.65 lacs OI with short covering seen at 8500 and below strike prices. Put option 8600-8400, 8200-8000 added huge 39.76 lacs OI with profit booking seen at 8300 strike price. 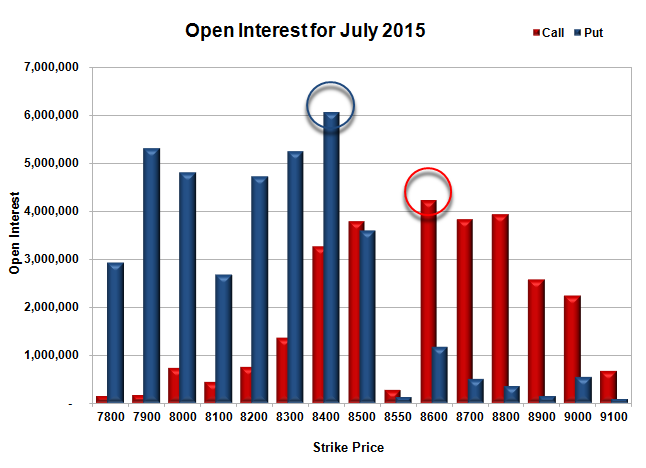 Nifty Open Interest is at 2,04,86,775 up by 6,20,850, with increase in price, most probably huge long build-up. 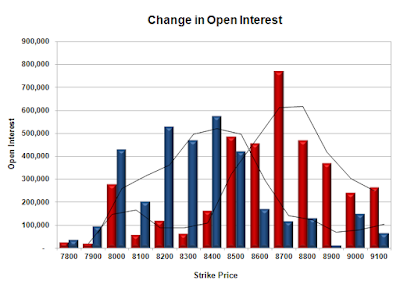 Bank Nifty Open Interest is at 17,21,075 down by 14,100, with increase in price, most probably small short covering. FII’s bought huge 13.27 lacs Futures, which includes 41744 contracts long build-up and 11317 contracts short covering, with increase in net OI by 30427 contracts (includes 111757 longs to 58696 shorts for the day) and the Average Price comes to 8668.15. 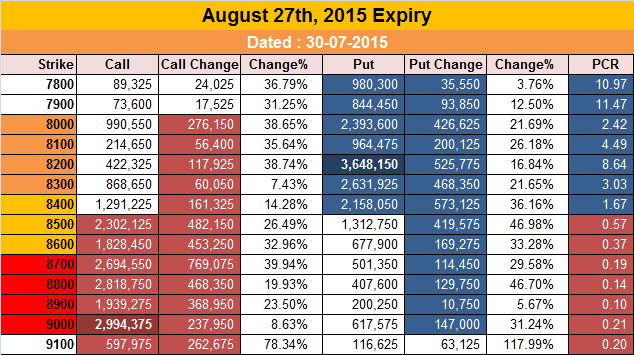 FII’s Index future open contract as on date is 618746 Longs to 235482 Shorts, Net Long 383264 contracts. Initial support up at 8500, with huge OI addition of 17.74 lacs and below that at 8400 with highest OI of 60.67 lacs. Initial and best resistance at 8600, with OI of 42.22 lacs and above that at 8700 with OI of 38.27 lacs. Day Range as per Option Table is 8442 - 8578 and as per VIX is 8454 - 8593 with 8506 as the Pivot. The Index opened positive but saw profit booking and stayed weak for the major part of the day, with only move around 8480 being sold into. The index ultimately closed flat at 8454.10, small loss 5.55 points. The broader market though was positive, with 832 advances to 665 declines. The range as per OI table comes to 7900-8800. 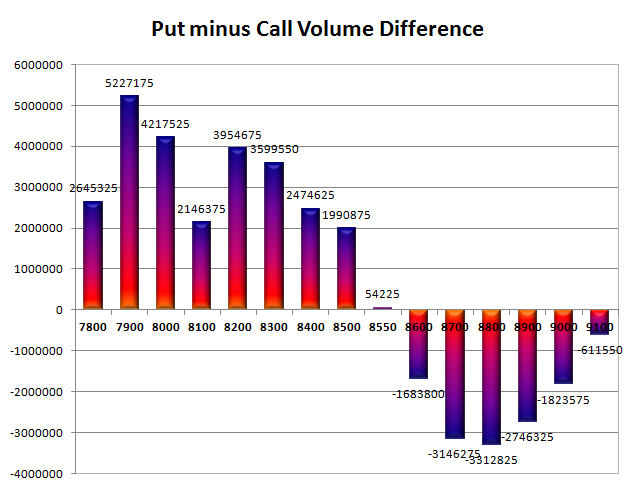 Call option 8600, 8800 added 5.96 lacs OI with short covering seen at 8400 and below strike prices. Put option 8500-8200, 8000 added 9.83 lacs OI with profit booking seen at 8100 and below strike price. Nifty Open Interest is at 1,98,65,925 up by 2,11,500, with small decrease in price, most probably short build-up. 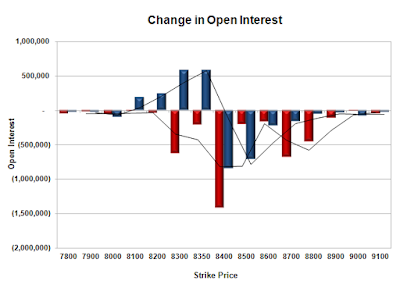 Bank Nifty Open Interest is at 17,35,175 down by 1,800, with decrease in price, most probably long liquidation. FII’s bought huge 10.21 lacs Futures, which includes 40754 contracts long build-up and 99 contracts short covering, with increase in net OI by 40655 contracts (includes 74842 longs to 33989 shorts for the day) and the Average Price comes to 8629.93. 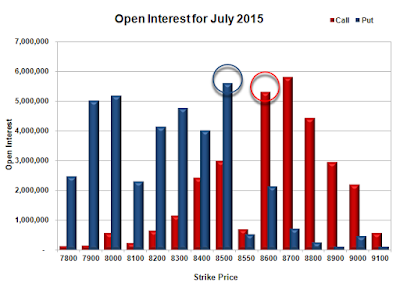 FII’s Index future open contract as on date is 577002 Longs to 246799 Shorts, Net Long 330203 contracts. 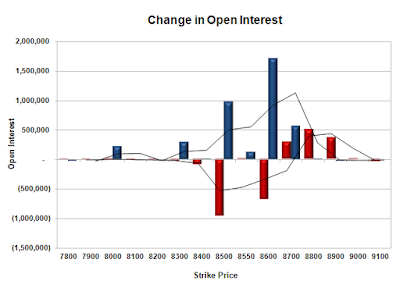 Initial support stays at 8400, with OI of 42.94 lacs and below that at 8300 with highest OI of 54.83 lacs. 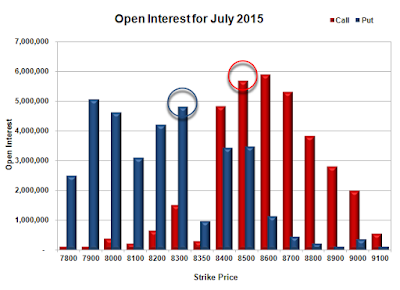 Initial and best resistance still at 8500, with OI of 46.83 lacs and above that at 8600 with OI of 41.14 lacs. 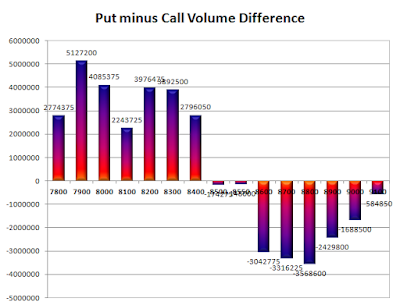 Day Range as per Option Table is 8384 - 8521 and as per VIX is 8383 - 8525 with 8453 as the Pivot.